Android: Copying text on your phone is already a bit of a pain, but bouncing back and forth between apps just to make a call is an even bigger hassle. Easy Copy helps fix this by letting you launch actions on your text like making a phone call or searching for an address. The app is invoked any time you copy text. Just select text like normal, hit the Copy button, and Easy Copy will appear like an actually-useful Clippy. 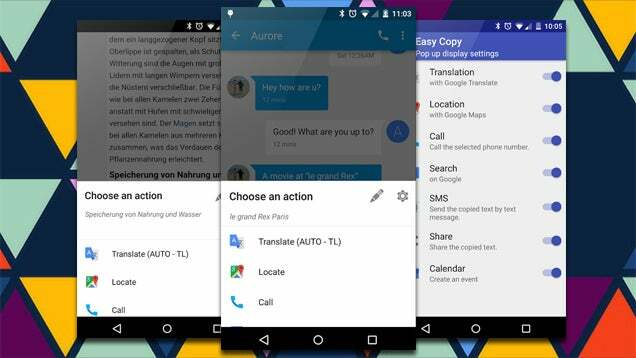 You can then choose to send that text to several pre-set apps like Translate, Maps, your SMS app, or Google. Or you can invoke the Share menu, which has even more options. Chances are good that when you copied that text, you wanted to do something with it. Easy Copy just skips the app-switching step.